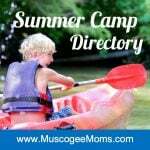 Why Advertise with Muscogee Moms? Thank you for considering advertising your business with us. We produce the largest, most comprehensive family-friendly Events Calendar and Parenting Resource in the region — making us truly Your Guide to Family Fun. Our calendar also includes events targeted specifically for moms and dads. Our annual events include the Muscogee Moms Choice Awards and the Kids Camp & Summer Fun Fair. These are clickable Medium Rectangle ads (300×250). They run in the right sidebar of every page, except our Summer Camp Directory. Sponsor perks include a specified number of Featured Event packages and advertising credit to be used towards our à la carte advertising menu. Price depends upon placement in sidebar. Summer Camp Directory ads are sold separately. Advertise your business in our *award-winning, weekly email newsletter. Your special event can be featured in our newsletter for two weeks. A business may also choose to purchase an email blast and have that email focus solely on your business. Our most popular ad package! Your special event can be featured on the home page of our website (in the Featured Event section) for two weeks. Packages include a specified number of posts on our Instagram, Twitter, and Facebook walls, as well as Newsletter Spotlights. Your business logo will be featured on our Home Page for up to a week. Your business profile will include your contact information, a few sentences (up to 150 words) about your business, a photo of your choice, and any other information, such as sales, classes or events. Do you only want to reach our Facebook audience? Or just reach our Newsletter subscribers? We offer à la carte advertising via our Social Media Network. A business may choose to purchase individual posts on our Instagram page, Twitter feed, Facebook wall, and Newsletter. A Facebook party is a LIVE, fast-paced, fun virtual event that uses the Facebook platform. It’s a great way to connect with others and discuss a hot topic, which is organized by using a specific hashtag. The event is facilitated by Muscogee Moms and usually lasts about an hour. Our email newsletter is award winning! *We are a 2010 and 2011 winner of the Constant Contact All Star Award — Only 10% of the email marketing company’s half-million customers achieve All-Star status every year. We’ve managed to win for consecutive years — putting us in an even more elite class.